Helen Mirren in a horror film is intriguing. The horror genre has been mostly stale, lacking originality while employing the same tropes over and over again. Nothing about them comes as much of a surprise anymore. This film was no different. The main problem with this one was that it took way too long to get going while failing to keep the viewer invested in the characters of the story. Being a relatively short film, it’s too little too late. For those who haven’t seen the many trailers that gave most of the story away. 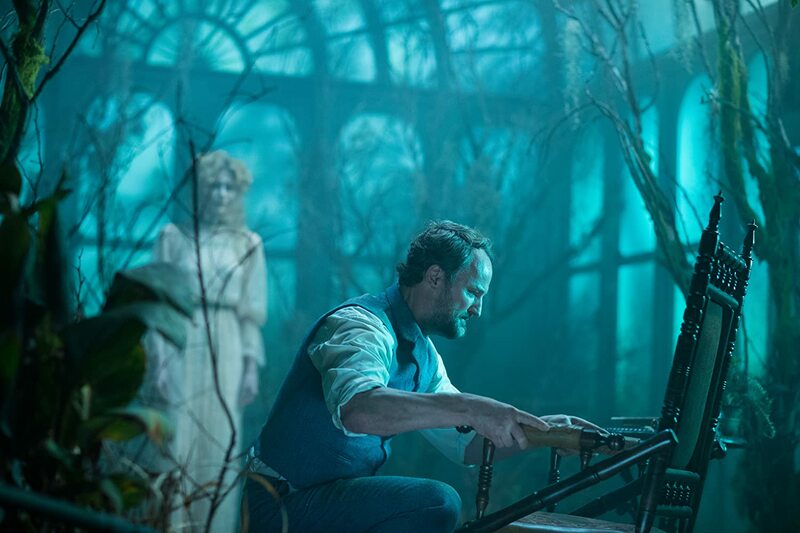 the story is about a doctor named Eric Price (Jason Clarke) who is tasked to assess the sanity of a woman named Sarah Winchester (Helen Mirren), an heiress to the Winchester fortune. In her grief, she has built a constantly expanding house to contain countless ghosts. Her sanity or lack thereof shouldn’t be hard to prove but it of course didn’t quite happen that way. This house, called the Winchester house, still exists today. If you ever wanted to learn more about the house, this film is probably not the best way to go. In terms of the story, there isn’t anything original about it whatsoever as a rational skeptic is placed in a new environment that challenges their beliefs until they somehow change. Price’s journey throughout the house is stringed along by a series of predictable jump scares which weren’t scary or will come as much of a surprise to most viewers. The film tells us what to expect early on so everything after that isn’t as shocking thus devoiding it of any suspense. From there, the film became more about him than Winchester herself. The problem with this was that the character of Price was just so dull to watch that it was difficult to ever get invested in him. The Winchester house is supposed to be this confusing, elaborate, maze of a house but this film failed to give us much of a sense of this other than from Winchester spewing line after line of exposition that eventually set up the final third of the film in a way that bloated it more than it needed to be. Not much happened before that, featuring other subplots that didn’t matter like Price’s backstory and another with Winchester’s niece Marian (Sarah Snook) and her son Henry (Finn Scicluna-O’Prey). By the time something actually happened during the final third of the film, it didn’t matter because most will have surely lost interest by then. The best part of the film was the performances which were okay but they obviously screamed phoning it in. Neither Mirren or Clarke seemed particularly interested in being there and it showed in their performances. Both are great actors, however, the script didn’t do them any favors as the characters were dull and the rest of the film was mostly on the boring side so they couldn’t do much to save it. Overall, this was a film with a promising concept involving the famed Winchester haunted house that was ultimately a dull and unoriginal horror film further let down by a dull script full of dull characters. For more, please visit keithlovesmovies.com. I went and saw this movie last night as a treat from one of my teenage daughters who likes horror as much as I do. I mentioned on Twitter “not a great movie but not bad”. The “not bad” I mentioned comes mostly from my interest in the Winchester home and the coolness of having a plot from the mind of Sarah Winchester. But as you mentioned, the plot derails and is more about him than her. That was also my disappointment with the movie, along with scares that were obviously coming (except for one, which had my daughter literally flipping upside down in her seat). To me it would have been much better to focus on Sarah and the house and have him more as the supporting role. The whole premise is the massive and odd house, yet we are treated to just a handful of rooms? Very disappointing. I was hoping to get a virtual tour of the home along with feelings Sarah had about each area. I’ll also say another thing I liked about it was how they spun in who was the evil entity. That was a good choice and had me watching to see who it was until the end. Yet that ending, once arrived, I didn’t get at all. I kept thinking I missed something but after reading your review, maybe it just missed the mark.